There has been a steady slew of fashion-focused tech startups to emerge in recent times, with the likes of Mallzee’s Tinder-esque app making small waves, and the more-established StyleUp and Thread also setting out to help you dress better. 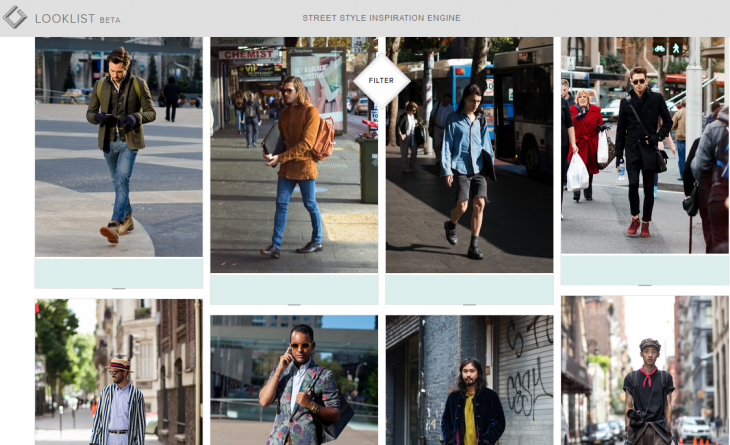 The latest chic startup to throw its proverbial hat into the fashion ring is Looklist, which touts itself as an “inspiration engine for street style.” In a nutshell, Looklist’s technology trawls all the top fashion blogs and sites and categorizes the images to make it searchable with filters and keywords. The homepage is essentially a constant stream of images which link out to the original source, though they can be saved to your own personal collection within Looklist too, or shared across the usual social channels. You can filter by gender, season, garment-type, fabric, color and, of course, style – so ‘Bohemian’ and ‘Skater/Surfer’ get a look-in here. Looklist basically trawls the Web for fashion photos so you don’t have to, tags them, and serves them up in a single, easy-to-search library. If you like a particular look, it also lets you search for ‘Similar’ items, which could be handy if you only like one particular outfit it has shown you, and you don’t want to carry out further manual searches. Looklist is still a beta product, but it’s open for anyone to use now. And we’re told that plans are afoot for native mobile apps in the future too, as well as on-demand styling tips and other related features.